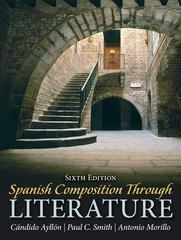 Spanish Composition Through Literature 6 Edition Spanish Composition Through Literature presents outstanding literature as models for writing. Readings illustrate a variety of topics, themes, styles, and techniques. Each chapter contains explanations and activities for vocabulary development, comprehension, interpretation, style, translation, and free composition.